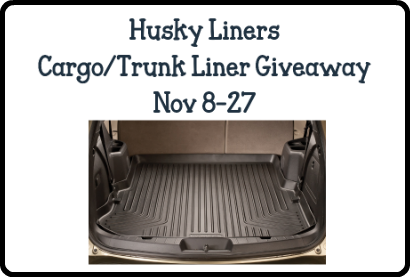 Welcome to the Husky Liners Cargo/Trunk Liner Giveaway hosted by Life With Two Boys. Tales From A Southern Mom has teamed up with Life With Two Boys to bring you this fabulous giveaway! This giveaway prize is perfect to give dad for Christmas or even to keep for yourself. Husky Liners are great for any vehicle to help protect from those nasty spills. To enter this giveaway read the details below. eCargoLiners by FamilyCarGear offers a wide range of floor protection items that families of today can use in their cars in order to make them look better and last longer. eCargoLiners provides custom, personalized service and helps the customer find and match what they need with the personal touch and attention in the form of excellent customer service. Check out their customer feedback on Amazon to see the rave reviews. One lucky reader is going to win a Husky Liners Floor or Cargo/Trunk Liner which offers superior carpet protection against mud, spills, and messes (perfect for on-the-go families!) The Cargo/Trunk Liner retails for $127-$147 depending on the make/model of the vehicle. Disclosure: No compensation was received for this post. Tales From A Southern Mom is not responsible for prize fulfillment. Next post: *Hot* Fly Bike foldable Scooters for toddlers just $25!!! Would be perfect for Christmas! I like the X-act Contour Series floor liner. I learned that this company was started by a man who wanted a product for himself. A company that came from an idea of necessity is great!